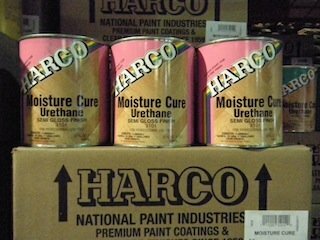 Moisture cure wood floor finish - Moisture cure finish is an easy to moderate wood floor finishes to apply, with very strong fumes, so speed is important. Use a mop applicator specified for moisture cure only and a brush that's specified for oil paints only. Purchase a set for each coat. 3 coats will require 3 sets of applicators. Remove any loose fibers and hairs. It's important to have proper ventilation when using moisture cure wood floor finish. Use only oil paint applicator to prevent puddling, splashes, to provide proper coverage and to allow wood finish to level itself properly. This will help reduce unwanted brush marks. Brush applicator - Start by cutting in the edges, with your brush, use a 3" or 4" brush, remove loose brush bristles before using. Carefully, coat the floor, avoid getting any oil on other surfaces. If, you accidentally do, you can use mineral spirit to clean it up, during your application process. When, coating the edges, you should brush across the grain, then complete your final brush strokes with the grain. Remember to check for puddles, splashes, or drips. When applying moisture cure wood floor finish, be sure to apply the proper coverage, so that the finish levels properly. Always, keep a wet edge. If, you apply to thin of a coat, It will set-up very fast, it can look dry, and may not level properly, leaving unwanted brush marks. Too heavy of a coat, the finish can be to shiny in that particular spot, and a puddle can occur. Plus you'll cause splashing with the brush as your moving the finish around. Be sure to maintain a wet edge at all time. By doing this you'll avoid unwanted lap marks. Block applicator - use a light applicator with a thin nap - recommended mohair. Remove any loose wool from the applicator. You can use a vacuum to do this. Avoid pulling on the fiber. This can create more loose fiber. Pour your moisture cure wood floor finish into a 5 gallon pail, you can also pour a line or puddle directly to the floor. Attach the applicator to a paint pole. Soak the applicator with moisture cure. Start from the furthest point away from your exit point. Working in a 5'x 5' area or smaller, apply a 12 inch x 5 foot puddle in front of you. Pre-coat the wood-flooring using a W-pattern. Apply downward pressure while your mopping. Avoid applying pressure to the middle of the paint pole, this can cause it to break. Overlap your passes. It's important that you pre-coat your floor, using one forward and back pass. While, making sure the wood flooring is completely coated. This will help you apply an even quantity of moisture cure finish across the surface. Once you've completed the pre-coat step. You want to do a light finish pass, using the same procedure with a tighter overlap, with less pressure and lifting your applicator as you brush away. Lifting your applicator at the end will prevent any hard stops or brush marks. On our final pass, apply as little pressure towards the applicator head as possible. Allow the applicator to float or glide across the surface. While doing this check, for splashes, unevenness, and missed spots, coat if necessary. For a more detail description on brushing techniques visit our oil base polyurethane finish page. Tip: If dealing with cold climate conditions. Maintain room temperature at 65 degrees. If the moisture cure wood floor finish does not dry to touch over night or within a 12-16hr period. Adjust the temperature higher, usually 70-72 degrees is more than enough. Any higher, you can end up with brush marks in your wood finish. Repeat both process for edging and mop applicator. Work towards the exit area. Open any windows necessary to allow unwanted fumes out, during the process of applying your moisture cure wood floor finishes. Allow to dry overnight. Tip: To confirm that your moisture cure finish is hard enough, firmly press your finger nail into the wood finish. If, it leaves a mark, then your moisture cure finish is still soft. Allow it more time for drying. If, you have exceeded the recommended dry time, scratch test the surface with your finger nail. No marks means the wood finish is durable enough to abrade. Buff or screen - wood flooring using a combination of white cleaning pad, maroon pad with 220 sanding strips. Abrade the floor, then vacuum and tack surface. Then apply the next coat. Repeat this process until you've applied 3 coats of moisture cure finish. Moisture cure finish is a tough, high quality finish with a very good reputation. When you choose this wood floor finish, you can be sure the your floors will last a very long time. Attention: Moisture cure maybe illegal in your state. Check your state law before you buy. Finish too difficult to apply? Afraid you may make a mistake?